Farmgirl Fare: You Still Have Time To Name That Sheep! Wow! I am absolutely overwhelmed by the incredible response to the First Ever Farmgirl Fare Name That Sheep Contest. I had no idea how many people out there want a sheep to call their very own. And it is really wonderful to hear from all of you new visitors. Welcome! Yellow 21 (who was kind enough to pose for these new photos just moments ago) is thrilled by all the attention, and The Secret Panel Of Judges is having a great time sifting through the dozens and dozens of entries. You have certainly come up with some interesting, innovative, often hysterical, and, well, truly unique names! Because we want to give careful consideration to each and every entry (and because we are also sort of swamped by farm duties after being away), it is going to be a few days before The Big Winner is announced. In the meantime, new entries (or comments stating why other suggested names should not be chosen) are still welcome. And as per your request, I also have a little more information for you about our girl--as well as these up-to-the-minute photos. Yellow 21 was born sometime between 9:00pm Sunday, March 23rd and 2:00am Monday, March 24th in 2003 to Doll Face (one of my oldest and favorite ewes). At 9:00pm I knew Doll Face was fairly close to giving birth, and so I put her in a bonding pen for the night. When I went down to check on her at 2:00am, she was busy taking care of her healthy, newborn twins. Doll Face's father was a black Border Leicester named The Count, and her mother was a Finn cross named Ulla (after Ulla Procope, a Finnish potter; at that time all sheep were being named after early 20th century female potters). Yellow 21's father was a large, friendly Hampshire ram named Big Boy. In late February of this year, Yellow 21 gave birth to the first lamb of the season, an adorable girl named Babs (or Babsie). If you really, really want to win this sheep, you might want to read through the entries again, as I noticed some people voted for names that had already been suggested (Alisha, this would be you). Or you can stick with your original vote and realize that you may only win half a sheep. 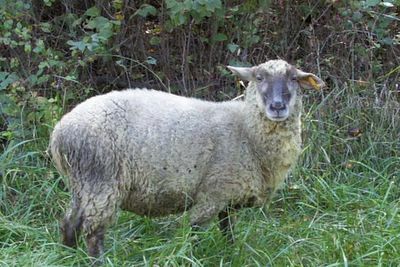 I know I didn't list the past and present names of all my sheep, but I will quickly mention that I already have a sheep named Mary (she is Doll Face's triplet sister), and one of the sheep in my original flock was a wonderful Rambouillet named Gertie (short for Gertrude). Oh, and Molly Doodle absolutely refuses to allow a sheep to be named after her. And just one last thing. You know those obnoxious recipe contests where they claim complete ownership of your recipe even if you don't win? Yep, well, I'm doing that. This means I can use any of your entries to name any of my sheep without even giving you credit (which of course you know I would never do) and without giving you the actual sheep (which I may or may not do). Good luck, and I sure hope everyone is having as much fun as I am naming that sheep! Click here to read the contest rules and the dozens of names already submitted. FARMGIRL, you did not tell why no A&B names???!! This is making me very courious. I am not playing because I want her to come to live at my house ! Welcome home, Susan. I can't wait to see the results. Hrm.... yeah, I noticed too that the reason for A and B names had not yet been said... but then this is Farmgirl... and you remember the "soon" right? LOL. Glad to see you back safe and sound Susan! Ok, I'm on the A/B bandwagon...you must tell us! Please note my very apologetic 2nd entry in the contest. I vote for Ewe-Genie - and welcome home!! OOoo, and welcome back, and what's with the A & B ban?! Even though Ewe-Genie is an excellent choice, I think the new sheep should be called Rover. Or Spot. Or maybe Rex. Note that none of those are A&B names. I'm sticking with Tallulah! It's just got such a nice ring to it. No, really, "Muffaletta" will be best for her. In addition to the well known sandwich, the name suggests the Cypriot Moufflon, a sheep so honored that it appears as the main image on their paper money, as well as in their ancient mosaics. And it sounds wooly too. Well,I 'm very, very sad "my" Chocolat Sheep isn"t brown at all. And second...there is also white chocolat..So , in ever which state she is in, she always fits with her name...Great, isn't it? So, chocolat it will be, for me! Oh, Cara, what have you started? Your "juicy reason" comment about the no A & B names being allowed had me LOL, but I'm afraid the actual reason for the ban is very, very boring, and now everyone is expecting something thrilling. I meant to write this yesterday so you (or anyone else) didn't spontaneously combust from curiosity during the night, but well, I didn't. Hope everyone survived. So that it would be easier to remember which lambs were born when, last year we decided to give all the female lambs born that year names starting with 'A.' And this year we gave them 'B' names. (Not that they have actually all been named yet; I told you it can take a while to get a name around here). Soooo. . . . that's it. Sorry it wasn't a juicy reason. I was planning to write a post about names called "S Is For Sheep" and include this A & B/alphabet info, but I couldn't let you suffer needlessly for one more second so have spilled the boring beans. As far as the contest itself, things are definitely heating up. We've had some very interesting late entries. I just don't understand it. Everyone seems to object when I suggest Rover as a name. One of my friends recently had her first born son and they had chosen a name before he was born but when he arrived, they decided it just wasn't right. I suggested Rover right away. And you know what? She just laughed!! P.S. "ewesed up" :-D good one!! P.P.S. Yes, thank you, I feel fine. No really. I do. Quite fine. Although it's difficult to type with this bizarre jacket that has the wraparound sleeves. P.P.P.S. The real reason for suggesting Rover: I don't remember the name of the movie but it was a charming story of some children who found a baby in a field. The children decided to adopt the baby and their first task was to name it. One of the children kept saying "I want to name it Rover!" It stuck with me ever since. I also felt the Pecorino name was worth remembering for a later sheep. In Britain, ejm, Rover is unfortunately a popular brand of fairly ugly car. It would be like calling a son "volvo"
You really cannot call a sheep cheesy! Pecorone, maybe, if she is really big. Or Pecoraccia if she is very bad. I like Gialloventuno still, but I could also go with Strepitosa. I can't wait to see what is her chosen name! I had so much fun reading the suggested names. My apologies for not personally responding to all of the comments you've left, especially the (extremely entertaining) ones under the Name That Sheep Contest original post. Not to worry, all of your entries have been received. And a warm welcome, welcome, welcome to all the new commenters! It's wonderful to hear from you. I think Stella is a great name BUT she should be sort of beefy with a swagger, don't you think? Yellow is definately a "Patience"......(I REALLY want a sheep!!!) I can bribe you with Kale Soup and Star Brownies which is my lunch today. I would put picture here but don't know how. I wasn't sure where to put my name for the sheep so I posted it on the other page with the lovely fog picture. Then I clicked on the link. I would like to suggest Sealy-like the mattress company in honor of those adorable commercials. Yellow 21 looks more like Mrs. MacTavish to me. Maybe it is just the photos but she looks too serious to be addressed by a first name. Can I still get in another late entry? How about larb? It sounds almost sheepish; it'll sound good when the other sheep come by to ask, "can Larb come out to play? "; while it's made with most meat, i've not seen it done with lamb so it's not cruelly self-referential; everyone loves larb; and any food that can get someone singing this song by the 14th post in the thread really deserves a critter named after it. I would just like to point out that "Muffaletta" has a host of brilliant nickname possibilities: Muffy, Letty, Etta, Falalalala, Uffalie, and so on, some admittedly catchier than others. And for formal occasions, she can use the full "Muffaletta Sandwich", which you must agree is widely adored and, uh, well-rounded. And it's so wooly sounding. I want to start by saying that I don't want a sheep, but I like to name things, so I am throwing a name in the hat, but NOT entering the contest. There is only one name that is suitable from my standpoint. Babaganoush. It's about the right color and more importantly it starts with Baa baa, so the sheep will always know you are speaking to it. Baba isn't a bad nickname, come to think of it. Seriously, if you name the sheep Babaganoush, please do not send me a sheep - Houston is crowded enough as it is. I have a second entry, borrowed from Wallace and Grommit - Shorn. Shorn is a fine name for a sheep, simple and meaningful. The way it ought to be. So, it either has to be Babaganoush or Shorn. 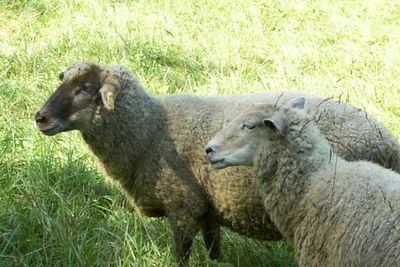 Also, I've reconsidered my stipulation about not wanting a sheep - after reading the rules of the contest:), and I decided that I would not mind owning a long-distance sheep at all. Count me in! I fear that Judith, though a far greater expert on the Italian language than I, left the false impression that pecorino means "cheesy" in Italian. 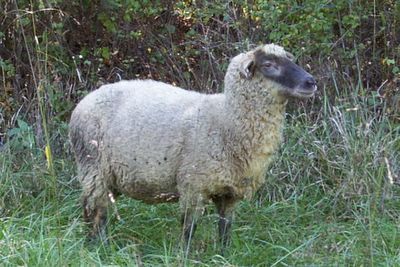 Pecorino is simply the word for cheese made from ewe's milk, as the Italian word for sheep is pecora. Hope that clears up any misunderstandings. Our lovely sheep will be happy to simply go by her adorable and fitting surname, Pepato, if you find the name to cheesy (although in her heart she will know her full name). Just a quick note to those of you I haven't responded to here--your entries and comments have all been noted. Thanks for playing! Buttered Rummie, she looks as cozy as a buttered rum!